River Valley High School students perform in front of guests at dress rehearsal, Thursday evening, before their musical opening night, Friday. 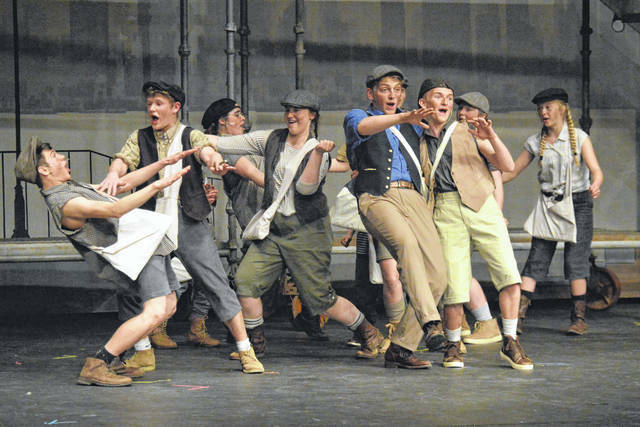 RIO GRANDE — River Valley High School students are dancing and singing their way onto the Alphus R. Christensen Theatre stage with Newsies The Musical Friday and Saturday evenings with doors opening at 6:30 p.m. The Alphus R. Christensen Theatre is located in the University of Rio Grande and Rio Grande Community College’s John W. Berry Fine and Performing Arts Center. “As a senior, I know that we set an example to the younger classmen. With this in mind, I want to be a positive role to them so that they can continue to excel. Musical season is my favorite time of the year,” said Ian Eblin, playing as lead character Jack Kelly. Auditions for the musical roles began in December and students have been preparing for the performances through January, February and March. Walker said that students joining River Valley musicals often come from all walks of life, whether they are already involved with music programs, athletics or more academic-focused extracurricular activities. Roughly 40 students make up the show’s cast and around 10 are serving as stage crew. Newsies The Musical is based off of the Newsboys Strike of 1899 against Joseph Pulitzer and William Randolph Hearst which forced their newspapers to change how they paid newspaper hawkers. The stage musical was also inspired by the 1992 musical film produced by Walt Disney Pictures of the same name. “The musical will be really good this year. Learning the historical context has helped us understand the struggles that working people have had. I am thankful to have been a part of River Valley theater,” said Ethan Browning who is playing the part of Joseph Pulitzer, the show’s antagonist.